September 8, 2007 – PCW: Jacko Lantern and Matt Silva defeated Adam Brooks and Diaz. March 1, 2008 – PWA: Lightning Luke defeated Ash Riot, Jacko Lantern, Mason Childs, Matt Silva and Mike Valuable in a 6-way match. August 7, 2009 – PWA: PWA A1GP champion Robbie Eagles defeated Matt Silva to retain the title. January 16, 2010 – NWA Pro Australia: Greg Graham defeated Matt Silva. February 6, 2010 – SFW: Ryan Rollins defeated Matt Silva. March 20, 2010 – NWA Pro Australia: Matt Silva defeated Mike Petersen. March 27, 2010 – SFW: Chris Trance and Jacko Lantern defeated Matt Silva and Mike Burr. September 11, 2010 – PCW: Jacko Lantern and Matt Silva defeated Adam Brooks and Jay Webster. October 2, 2010 – RCW: Adam Brooks and Matt Silva defeated GD Grimm and Jacko Lantern. October 16, 2010 – PCW: Matt Silva defeated Sean O’Shea. October 22, 2010 – MCW: MCW heavyweight champion Danny Psycho defeated Matt Silva to retain the title. November 20, 2010 – RCW: Matt Silva defeated Luke Santamaria. December 3, 2010 – PCW: Matt Silva defeated Danny Psycho to win the PCW State title. December 4, 2010 – RCW: Luke Santamaria and TJ Rush defeated Adam Brooks and Matt Silva. December 11, 2010 – PCW: Danny Psycho defeated Matt Silva to win the PCW State title. January 29, 2011 – RCW: RCW heavyweight champion Jacko Lantern defeated Matt Silva to retain the title. March 5, 2011 – PCW: Danny Psycho defeated Matt Silva. March 25, 2011 – RCW: Kracker Jack defeated Matt Silva. April 2, 2011 – RCW: Voodoo defeated Matt Silva. April 16, 2011 – MCW: Adam Brooks and Matt Silva defeated KrackerJak and Mike Petersen. April 29, 2011 – MCW: Kracker Jack defeated Matt Silva. May 7, 2011 – RCW: Matt Silva defeated Rocky Menero. May 14, 2011 – PCW: Cletus Blood defeated Matt Silva. June 4, 2011 – PCW: Jacko Lantern defeated Matt Silva. June 11, 2011 – RCW: Voodoo defeated Matt Silva. June 18, 2011 – RCW: Matt Silva defeated Bebop. June 20, 2011 – MCW: Matt Silva and Adam Brooks defeated Cletus and Seth Taylor. July 9, 2011 – MCW: Matt Silva defeated Mike Petersen. July 16, 2011 – MCW: Matt Silva and Melody Summers defeated Adam Brooks and Sway. July 29, 2011 – MCW: Danny Psycho defeated Matt Silva. August 26, 2011 – MCW: Matt Silva defeated Jacko Lantern. September 3, 2011 – RCW: Matt Silva defeated Jimmy Scarlet. September 10, 2011 – PCW: Matt Silva defeated Jacko Lantern in a tables match. September 30, 2011 – MCW: Cletus defeated Matt Silva by disqualification. October 8, 2011 – RCW: Matt Basso (GD Grimm) defeated Bebop, Jimmy Scarlet, Matt Silva, Tim Burgundy and Voodoo in a 6-way match. October 22, 2011 – RCW: Matt Silva defeated Robbie Eagles. November 4, 2011 – RCW: Ryan Rollins defeated Matt Silva in a tables match. December 3, 2011 – MCW: Matt Silva defeated Roger Ventura. January 28, 2012 – MCW: Matt Silva defeated Slex to win the heavyweight title. February 24, 2012 – MCW: Matt Silva defeated Slex to retain the heavyweight title. March 30, 2012 – MCW: Carlo Cannon, Ryan Rollins and Slex defeated Adam Brooks, Danny Psycho and Matt Silva. April 21, 2012 – MCW: MCW heavyweight champion Matt Silva defeated Sonjay Dutt to retain the title. April 27, 2012 – MCW: Matt Silva defeated Carlo Cannon. May 25, 2012 – MCW: Elliot Sexton and Jonah Rock defeated Matt Silva and Adam Brooks. June 29, 2012 – MCW: Adam Brooks and Matt Silva defeated Danny Psycho and Mimic. July 14, 2012 – MCW: MCW heavyweight champion Matt Silva defeated Chris Basso to retain the title. July 27, 2012 – MCW: Matt Silva defeated Gabriel Wolfe. August 18, 2012 – MCW: MCW heavyweight champion Matt Silva defeated GD Grimm to retain the title. September 14, 2012 – MCW: MCW heavyweight champion Matt Silva defeated Elliot Sexton to retain the title. September 15, 2012 – EPW: Adam Brooks, Carlo Cannon and Matt Silva defeated Marcius Pitt, Mikey Nicholls and Shane Haste. October 26, 2012 – MCW: Matt Silva defeated Ryan Collins. November 16, 2012 – MCW: Mike Petersen defeated Matt Silva to win the heavyweight title. November 23, 2012 – MCW: Jacko Lanthern, Kracker Jack and Matt Silva defeated Mike Burr, Jay Andrews and Mike Petersen. February 16, 2013 – MCW: MCW heavyweight champion Mike Petersen defeated Matt Silva in a street fight to retain the title. April 13, 2013 – MCW: Adam Brooks defeated Matt Silva. November 23, 2013 – NXT Live Event: Angelo Dawkins, Colin Cassady and Wesley Blake defeated Buddy Murphy, Sawyer Fulton and Troy McClain. December 12, 2013 – NXT Live Event: Jason Jordan and Matt Morgan defeated Buddy Murphy and Danny Burch. May 15, 2014 – NXT: The Ascension defeated Buddy Murphy and Elias Sampson in a non-title tag team match. June 6-7, 2014 – NXT Live Event: Kalisto defeated Buddy Murphy. June 27, 2014 – NXT Live Event: Kalisto and Sin Cara defeated Buddy Murphy and Wesley Blake. July 3, 2014 – NXT: Solomon Crowe defeated Buddy Murphy in a dark match. July 12, 2014 – NXT Live Event: Dash Wilder and Scott Dawson defeated Buddy Murphy and Wesley Blake. August 14, 2014 – NXT: Kalisto and Sin Cara defeated Buddy Murphy and Wesley Blake in the 1st round of the NXT tag team titles tournament. August 21, 2014 – NXT: Solomon Crowe defeated Buddy Murphy in a dark match. August 7, 2014 – NXT Live Event: Marcus Louis and Sylvester Lefort defeated Buddy Murphy and Wesley Blake. 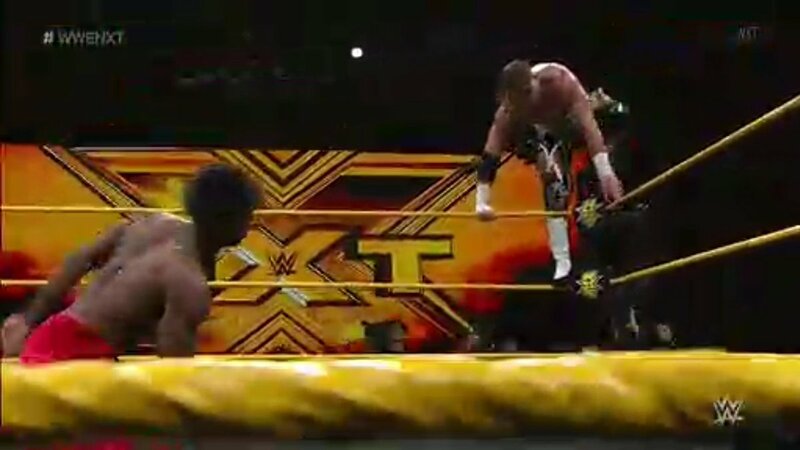 August 21, 2014 – NXT Live Event: Kalisto and Solomon Crowe defeated Buddy Murphy and Wesley Blake. August 23, 2014 – NXT Live Event: Kalisto and Solomon Crowe defeated Buddy Murphy and Wesley Blake. September 6, 2014 – NXT Live Event: Buddy Murphy, Kalisto and Wesley Blake defeated Jason Jordan, Sawyer Fulton and Tye Dillinger. September 13, 2014 – NXT Live Event: Aiden English and Simon Gotch defeated Wesley Blake and Buddy Murphy. September 18, 2014 – NXT: Dash Wilder and Scott Dawson defeated Wesley Blake and Buddy Murphy in a dark match. September 18, 2014 – NXT Live Event: Aiden English and Simon Gotch defeated Wesley Blake and Buddy Murphy. October 16, 2014 – NXT: Sin Cara and Kalisto defeated Wesley Blake and Buddy Murphy. October 24, 2014 – NXT Live Event: Dash Wilder and Scott Dawson defeated Buddy Murphy and Wesley Blake. October 30, 2014 – NXT Live Event: The Ascension defeated Buddy Murphy and Wesley Blake. October 30, 2014 – NXT: Aiden English and Simon Gotch defeated Wesley Blake and Buddy Murphy, The Ascension, Colin Cassidy and Enzo Amore & Jason Jordan and Tye Dillinger in a #1 contenders battle royal to beocme #1 contenders for the tag team titles. November 6, 2014 – NXT Live Event: Dash Wilder and Scott Dawson defeated Buddy Murphy and Wesley Blake. November 13, 2014 – NXT: NXT tag team champions Sin Cara and Kalisto defeated Buddy Murphy and Wesley Blake in a non-title match. November 20, 2014 – NXT Live Event: Dash Wilder and Scott Dawson defeated Buddy Murphy and Wesley Blake. November 21, 2014 – NXT Live Event: Buddy Murphy and Wesley Blake defeated Scott Dawson and Dash Wilder. December 4, 2014 – NXT Live Event: Buddy Murphy and Wesley Blake defeated Dash Wilder and Scott Dawson. December 5-6, 2014 – NXT Live Event: Buddy Murphy and Wesley Blake defeated Jason Jordan and Chad Gable. January 9, 2015 – NXT Live Event: Dash Wilder and Scott Dawson defeated Buddy Murphy and Wesley Blake. January 10, 2015 – NXT Live Event: Buddy Murphy and Wesley Blake defeated Dash Wilder and Scott Dawson. January 16-17, 2015 – NXT Live Event: Wesley Blake and Buddy Murphy defeated Simon Gotch and Aiden English. January 21, 2015 – NXT: Buddy Murphy and Wesley Blakde defeated Simon Gotch and Aiden English. January 28, 2015 – NXT: Buddy Murphy and Wesley Blake defeated Sin Cara and Kalisto to win the NXT tag team titles. January 30-31, 2015 – NXT Live Event: Buddy and Murphy defeated Simon Gotch and Simon Gotch. February 6, 2015 – NXT Live Event: Buddy and Murphy defeated Simon Gotch and Simon Gotch. February 11, 2015 – NXT Takeover Rival: NXT tag team champions Buddy and Murphy defeated Sin Cara and Kalisto to retain the titles. February 13, 2015 – NXT Live Event: Buddy and Murphy defeated Enzo Amore and Colin Cassady. March 7, 2015 – WWE Experience 1: Colin Cassady defeated Murphy. Murphy defeated Simon Gotch. March 12, 14, 2015 – NXT Live Event: Blake and Murphy defeated Sawyer Fulton and Tucker Knight. March 18, 2015 – NXT: Wesley Blake w Buddy Murphy defeated Colin Cassady w Enzo Amore and Carmella. April 1, 2015 – NXT: Blake and Murphy defeated The Lucha Dragons. April 2, 2015 – NXT Live Event: Blake and Murphy defeated Dash Wilder and Scott Dawson. April 3, 2015 – NXT Live Event: Blake and Murphy defeated Colin Cassady and Enzo Amore. April 4, 2015 – NXT Live Event: Colin Cassady and Enzo Amore defeated The Vaudevillains & NXT tag champions Blake and Murphy in a 3-way non-title match. April 29, 2015 – NXT: Colin Cassady and Enzo Amore w Carmella defeated NXT tag team champions Blake and Murphy in a non-title match. May 9, 2015 – NXT Live Event: Colin Cassady and Enzo Amore w Carmella defeated NXT tag team champions Blake and Murphy in a non-title match. May 14, 2015 – NXT Live Event: NXT tag team champions Blake and Murphy defeated Colin Cassady and Enzo Amore w Carmella to retain the titles. May 16, 2015 – NXT Live Event: NXT tag team champions Blake and Murphy defeated Colin Cassady and Enzo Amore w Carmella to retain the titles. June 12-13, 2015 – NXT Live Event: NXT tag team champions Blake and Murphy w Alexa Bliss defeated Mojo Rawley and Zack Ryder to retain the titles. June 20, 2015 – NXT Live Event: Colin Cassady and Enzo Amore defeated Chad Gable and Jason Jordan & Blake and Murphy in a 3-way non-title tag match. October 14, 2015 – NXT: Murphy was in the #1 contenders battle royal for the NXT title won by Apollo Crews. November 5, 2015 – WrestleMania 32 Pre Sale Party: The Hype Bros (Mojo Rawley and Zack Ryder) defeated Blake and Murphy w Alexa Bliss. November 7, 2015 – NXT Live Event: NXT tag team champions Dash Wilder and Scott Dawson defeated The Vaudevillains, Blake and Murphy w Alexa Bliss & Chad Gable and Jason Jordan in a 4-way tag team match to retain the titles. December 14-15, 2015 – NXT Live Event: Colin Cassady and Enzo Amore defeated Blake and Murphy w Alexa Bliss. January 9, 2016 – NXT Live Event: Mojo Rawley and Zack Ryder defeated Blake and Murphy & Hugo Knox and Tucker Knight in a 3-way tag match. January 27, 2016 – NXT: Chad Gable and Jason Jordan defeated Blake and Murphy. January 29, 2016 – NXT Live Event: Mojo Rawley and Zack Ryder defeated Blake and Murphy. January 30, 2016 – NXT Live Event: Tino Sabbatelli and Tucker Knight defeated Blake and Murphy. February 4, 2016 – NXT Live Event: Chad Gable and Jason Jordan defeated Blake and Murphy. February 11, 2016 – NXT Live Event: Mojo Rawley and Zack Ryder defeated Blake and Murphy. February 18, 2016 – NXT Live Event: Chad Gable and Jason Jordan defeated Blake and Murphy & Dash Wilder and Scott Dawson in a 3-way tag team match. February 25, 2016 – NXT Live Event: Chad Gable and Jason Jordan defeated Blake and Murphy, The Vaudevillains & Colin Cassady and Enzo Amore in a 4-way tag team elimination match to become #1 contenders for the tag titles. March 4-5, 10, 2016 – NXT Live Event: Colin Cassady and Enzo Amore defeated Blake and Murphy. March 18, 2016 – NXT Live Event: Kenneth Crawford and Patrick Clark defeated Blake and Murphy. March 31, 2016 – WrestleMania Axxess: Colin Cassady and Enzo Amore defeated Blake and Murphy. April 2, 2016 – WrestleMania Axxess: Patrick Clark and Tye Dillinger defeated Blake and Murphy. April 22, 2016 – NXT Live Event: Patrick Clark defeated Murphy. April 23, 2016 – NXT Live Event: Alex Riley defeated Murphy. April 27, 2016 – NXT: Mojo Rawley and Zack Ryder defeated Blake and Murphy. May 6, 2016 – NXT Live Event: Austin Aries defeated Murphy. May 5, 7, 12,14, 2016 – NXT Live Event: No Way Jose defeated Murphy. May 13, 2016 – NXT Live Event: Mojo Rawley defeated Murphy. May 21, 2016 – NXT Live Event: Christopher Girard defeated Murphy. May 27, 2016 – NXT Live Event: Tye Dillinger defeated Murphy. June 1, 2016 – NXT: Tye Dillinger defeated Murphy. June 3-4, 2016 – NXT Live Event: Shinsuke Nakamura defeated Murphy. June 22, 2016 – NXT: Shinsuke Nakamura defeated Murphy. July 7, 2016 – NXT: Blake and Murphy vs. The Hype Bros (Mojo Rawley and Zack Ryder) ended in a no contest. July 8, 2016 – NXT Live Event: Shinsuke Nakamura defeated Murphy. July 16, 2016 – NXT Live Event: Mojo Rawley defeated Murphy. July 22, 2016 – NXT Live Event: Shinsuke Nakamura defeated Buddy Murphy. July 27, 2016 – NXT: Kota Ibushi defeated Murphy. July 28, 2016 – NXT Live Event: Mojo Rawley defeated Buddy Murphy. July 29, 2016 – NXT Live Event: Johnny Gargano defeated Buddy Murphy. July 30, 2016 – NXT Live Event: Mojo Rawley defeated Buddy Murphy. August 4, 2016 – NXT Live Event: Oney Lorcan defeated Buddy Murphy. August 5, 2016 – NXT Live Event: Mojo Rawley defeated Buddy Murphy. August 6, 2016 – NXT Live Event: Oney Lorcan defeated Buddy Murphy. August 11, 2016 – NXT Live Event: Andrade Almas defeated Buddy Murphy. August 12, 2016 – NXT Live Event: Buddy Murphy defeated Adrian Jaoude. August 31, 2016 – NXT: Tye Dillinger defeated Buddy Murphy. September 8, 2016 – NXT Live Event: Hideo Itami defeated Buddy Murphy. September 9, 2016 – NXT Live Event: Andrade Almas defeated Buddy Murphy. September 17, 2016 – NXT Live Event: Oney Lorcan defeated Buddy Murphy. October 12, 2016 – NXT: Buddy Murphy vs. Wesley Blake ended in a no contest. October 15, 2016 – NXT Live Event: Buddy Murphy defeated Adrian Jaoude. October 26, 2016 – NXT Live Event: Buddy Murphy defeated Wesley Blake. October 27, 2016 – NXT Live Event: Patrick Clark defeated Buddy Murphy. October 28, 2016 – NXT Live Event: Wesley Blake defeated Patrick Clark. November 12, 2016 – NXT Live Event: Roderick Strong defeated Buddy Murphy. November 18, 2016 – NXT Live Event: Tommy End defeated Buddy Murphy. December 5, 2016 – NXT Live Event: Buddy Murphy defeated Wesley Blake. December 7, 2016 – NXT Live Event: Buddy Murphy defeated Akira Tozawa. December 11, 2016 – NXT Live Event: Buddy Murphy defeated Elias Samson. January 13, 2017 – NXT Live Event: Tozawa defeated Buddy Murphy. January 14, 2017 – NXT Live Event: Jack Gallagher defeated Buddy Murphy. February 11, 2017 – NXT Live Event: Buddy Murphy defeated Dan Matha. February 16, 18, 2017 – NXT Live Event: Elias Samson defeated Buddy Murphy. February 24, 2017 – NXT Live Event: Buddy Murphy defeated El Vagabondo (Elias Samson). February 25, 2017 – NXT Live Event: Buddy Murphy defeated Dan Matha. March 2, 2017 – NXT Live Event: Buddy Muprhy defeated Dan Matha. March 9, 2017 – NXT Live Event: Boddy Roode defeated Buddy Murphy to retain the NXT title. March 11, 2017 – NXT Live Event: Buddy Murphy defeated Tino Sabbatelli. April 14, 2017 – NXT Live Event: Buddy Murphy defeated Adrian Jaoude. April 15, 2017 – NXT Live Event: Buddy Murphy defeated Brennan Williams. April 28, 2017 – NXT Live Event: Buddy Murphy defeated Brennan Williams. June 2, 2017 – NXT Live Event: Buddy Murphy defeated Andrade Almas. July 7, 2017 – NXT Live Event: The Velveteen Dream defeated Buddy Murphy. July 14, 2017 – NXT Live Event: Buddy Murphy defeated Cezar Bononi. July 27, 2017 – NXT Live Event: Hideo Itami defeated Buddy Murphy. October 5, 13, 27, 2017 – NXT Live Event: Buddy Murphy defeated Babatunde Aiyegbusi. October 7, 26, 2017 – NXT Live Event: No Way Jose defeated Buddy Murphy. October 19, 2017 – NXT Live Event: Buddy Murphy defeated Cheng Yuxiang. November 4, 2011 – NXT Live Event: Roderick Strong defeated Buddy Murphy. November 30, 2017 – NXT Live Event: Buddy Murphy was in the battle royal won by Trent Seven. December 1, 2017 – NXT Live Event: Wolfgang defeated Buddy Murphy. December 2, 15, 2017 – NXT Live Event: Buddy Murphy defeated Brennan Williams. December 14, 16, 2017 – NXT Live Event: Aleister Black defeated Buddy Murphy. January 5, 2018 – NXT Live Event: Raul Mendoza defeated Buddy Murphy. January 6, 2018 – NXT Live Event: Buddy Murphy defeated Tian Bing. January 20, 2018 – NXT Live Event: Aleister Black defeated Buddy Murphy. February 3, 2018 – NXT Live Event: Buddy Murphy defeated Brennan Williams, Jeet Rama and Raul Mendoza in a 4-way match to become #1 contender for the NXT title. February 8, 15, 2018 – NXT Live Event: Aleister Black defeated Buddy Murphy. February 17, 2018 – NXT Live Event: Buddy Murphy defeated Raul Mendoza. February 20, 2018 – 205 Live: Buddy Murphy defeated Ariya Daivari in the 1st round. February 22-25, 2018 – NXT Live Event: Ricochet defeated Buddy Murphy. March 2, 2018 – NXT Live Event: Buddy Murphy defeated Raul Mendoza. March 6, 2018 – 205 Live: Mustafa Ali defeated Buddy Murphy in the quarter-finals of the cruiserweight title tournament. March 24, 2018 – NXT Live Event: Pete Dunne defeated Buddy Murphy to retain the WWE United Kingdom title. 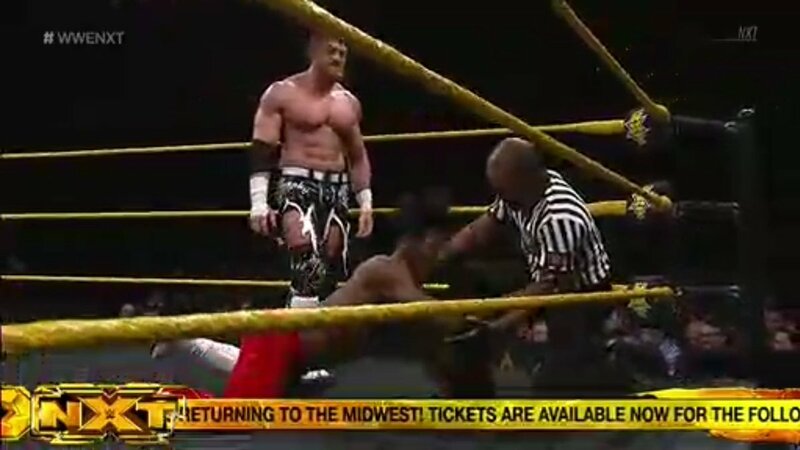 March 30, 2018 – NXT Live Event: Buddy Murphy defeated Christopher Dijak. April 5, 2018 – WrestleMania Axxess: Lio Rush defeated Buddy Murphy in the 1st round of the WWE United Kingdom title tournament. April 27, 2018 – NXT Live Event: Ricochet defeated Buddy Murphy. May 1, 2018 – 205 – Live: Buddy Murphy defeated Liam Louie. May 8, 2018 – 205 Live: Buddy Murphy defeated Mustafa Ali. May 29, 2018 – 205 Live: Cedric Alexander defeated Buddy Murphy to retain the cruiserweight title. June 1-3, 2018 – WWE Live Event: Cedric Alexander defeated Buddy Murphy to retain the cruiserweight title. June 5, 2018 – 205 Live: Buddy Murphy vs. Mustafa Ali ended in a no contest. June 19, 2018 – 205 Live: Hideo Itami defeated Buddy Murphy and Mustafa Ali in a 3-way match. July 3, 2018 – 205 Live: Mustafa Ali defeated Buddy Murphy in a no disqualification match. July 6-8, 2018 – WWE Live Event: Cedric Alexander defeated Buddy Murphy to retain the cruiserweight title. July 10, 2018 – 205 Live: Kalisto w The Lucha House Party defeated Tony Nese w Buddy Murphy by disqualification. July 14, 2018 – NXT Live Event: Buddy Murphy defeated Mars Wang. August 3-5, 2018 – Live Event: Cedric Alexander defeated Buddy Murphy to retain the cruiserweight title. August 21, 2018 – 205 Live: The Lucha House Party (Gran Metalik and Lince Dorado) defeated Buddy Murphy and Tony Nese in a tornado rules match. September 7-9, 2018 – Live Event: The Lucha House Party (Gran Metalik and Lince Dorado) defeated Buddy Murphy and Tony Nese. September 11, 2018 – 205 Live: Buddy Murphy defeated Gran Metalik. October 6, 2018 – WWE Super-Showdown: Buddy Murphy defeated Cedric Alexander to win the cruiserweight title. October 27-28, 2018 – Live Event: Buddy Murphy defeated Cedric Alexander to retain the cruiserweight title. November 6, 2018 – 205 Live: WWE cruiserweight champion Buddy Murphy defeated Mark Andrews in a non-title match. November 18, 2018 – Survivor Series: Buddy Murphy defeated Musfata Ali to retain the cruiserweight title. November 21, 2018 – 205 Live: Tony Nese w Buddy Murphy defeated Noam Dar. November 27, 2018 – 205 Live: Cedric Alexander and Mustafa Ali defeated Buddy Murphy and Tony Nese. December 5-6, 2018 – Live Event: Buddy Murphy defeated Gran Metalik to retain the cruiserweight title. December 11, 2018 – 205 Live: WWE cruiserweight champion Buddy Murphy defeated Gran Metalik in a non-title match. December 16, 2018 – TLC Kickoff: Buddy Murphy defeated Cedric Alexander to retain the cruiserweight title. January 11-13, 2019 – Live Event: Buddy Murphy defeated Cedric Alexander to retain the cruiserweight title. 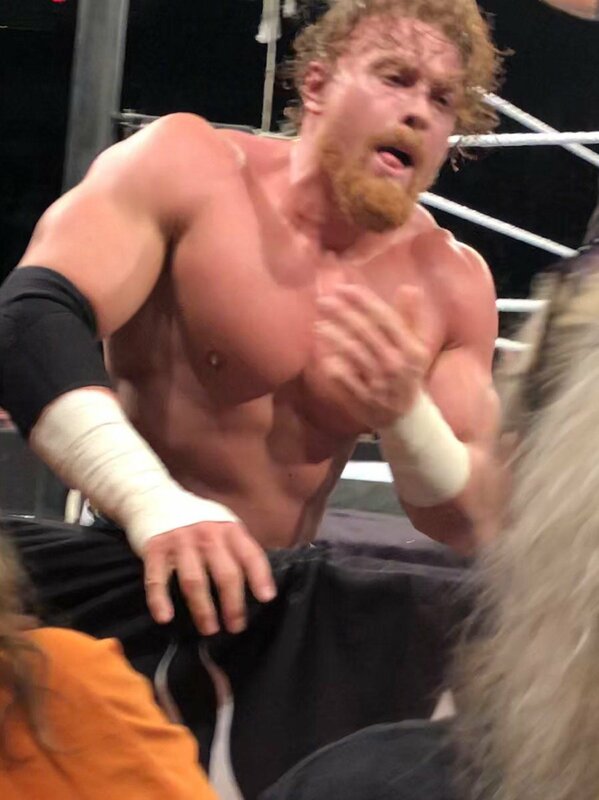 January 15, 2019 – Live Event: WWE cruiserweight champion Buddy Murphy defeated Humberto Carrillo in a non-title match. January 27, 2019 – Royal Rumble Kickoff: Buddy Murphy defeated Kalisto, Akira Tozawa and Hideo Itami in a 4-way match to retain the cruiserweight title. February 17, 2019 – Elimination Chamber Kickoff: Buddy Murphy defeated Akira Tozawa to retain the cruiserweight title. March 29-31, 2019 – Live Event: Buddy Murphy defeated Tony Nese to retain the cruiserweight title. April 7, 2019 – WrestleMania 35 Kickoff: Tony Nese defeated Buddy Murphy to win the cruiserweight title. April 9, 2019 – 205 Live: Tony Nese defeated Buddy Murphy to retain the cruiserweight title. I my opinion I personally feel this match should have been a main event nxt caliber match ! Both. @WWE_Murphy and . @VelveteenWWE can carry any brand anytime !